Skills and Abilities: Trained hand to hand combatant thanks to training at the Massachusetts academy X.S.G. Powers: Possesses a synchronic aura allowing him to duplicate the powers of any nearby superhuman. This includes non-mutants such as Spider-Man as well. Once in Synch with a superhuman he can use their powers naturally as if by second nature, often eclipsing the original user in its use. 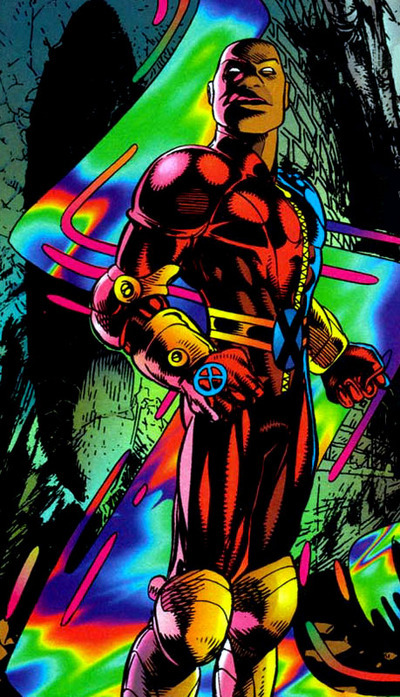 His power allows him to track other mutants and perceive and sense super-humans. An undefined trait he showed was duplicating knowledge from a target. He once duplicated Forge’s brilliance enabling him to stop a foe. In theory over time he would have been able to retain all the powers or knowledge he had come in contact with making him potentially one of the most power and brilliant beings to ever exist. Everett Thomas was born into the Thomas family and lived in St. Louis. He is described as Calm, Over Confident and a portrait of synchronicity [Generation X #1]. Everett always worked hard and dreamed of going to college and of majoring in political science…he wanted to reach out to people—to make a difference [Generation X #15]. Little else is know about his past before he manifested his mutant abilities. During the Phalanx Covenant he accidentally channeled the powers of the X-man Banshee, resulting in shattered glasses and traumatized citizens. The police was called in and they held him at gun point for reckless endangerment, vandalism and negligent assault. He had used the powers when the Phalanx tried to capture him. When they attacked once more he was rescued by Banshee and Sabretooth. The aliens were relentless however and it took Synch working with Emma Frost while using Jubilee’s powers to end the threat [X-men v2.#36]. Flying to Emma Frost’s safe house with Banshee and Jubilee, he immediately he began to bond with Jubilee [Uncanny X-men #317]. After the team tracked the captured new mutants including the M-twins he accompanied them in the rescue efforts. When Blink sacrificed herself to save everyone Banshee almost drowned and it was Synch who rescued him [X-men v2. #37]. 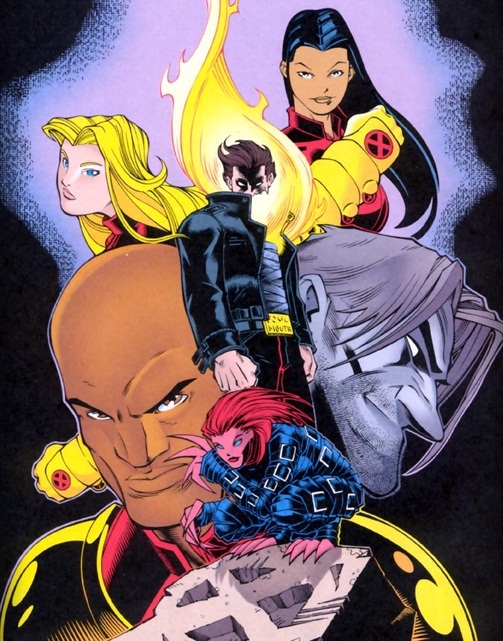 Together with Jubilee, Skin, M-twins and Husk they joined Emma Frost’s Massachusetts school which was now allied with Professor-X to form Generation-X [Generation X #1]. The team spent weeks training as Synch learned what it meant to be a mutant. When Jonothan Starsmore came in to join the team Synch was a part of the welcome wagon who aided in driving off Emplate, the mutant vampire [Generation X #1]. After Penance is dropped on school grounds by Gateway and goes on a rampage he aids in the search for her [Generation X #3]. While in New York City along with his team, they Witness the M-Twin’s ‘catatonic Fugue state’ and are unable to rouse them [Generation X #5]. They also battle the Gene-Nation, the next generation of morlocks [Generation X #5]. He manages to use his powers to track down the Gene-nationals to save Emma Frost and the young mutant Leech [Generation x #6]. Alongside Skin he builds a tree house for Artie and Leech [Generation X #7]. He is present when they journeyed to Fairyland [Generation X #8-9]. When Omega Red attacks the team he is taken down [Generation X #10-11]. He is later captured by Emplate’s Hellions as they try to recapture Penance and torture the M-twins [Generation X #12-13]. Emplate then uses his powers to make Synch his familiar and sends him to kill his family [Generation X #14]. Making his way back home he frightened his parents Ida and Stan before heading to his old school. Before he could feed on the janitor the M-Twins, Jubilee and Husk arrived to try to stop him. Their arrival however only proved to make Synch even more powerful as he channeled all their powers at once [Generation X #15]. He proved to be an overwhelming threat to the trio and it was only when he used his powers on the M-twins was he overwhelmed enough to be shocked back to his senses [Generation X #16]. After the ordeal he continued to grow closer to Jubilee, she even remarked he was her best friend besides Wolverine [Generation X #17]. During the Onslaught crisis he was abducted along with the rest of the team by Emma Frost [Generation X #18-19]. When Black Tom Cassidy attacked the school Synch and his teammates were cast into the middle of the ocean [Generation X #25]. When the demon Nightmare shows the team their deepest desires, Everett is shown to want a stable relationship with best friend Jubilee [Generation X #28]. The team also battles Skin’s ex Torres and her gang, alongside the Prime Sentinels while Jubilee is captured during Operation Zero Tolerance [Generation X #29]. Synch convinces the M-twins to give him his first kiss when he becomes unsure that they will survive their ordeal [Generation X #30]. 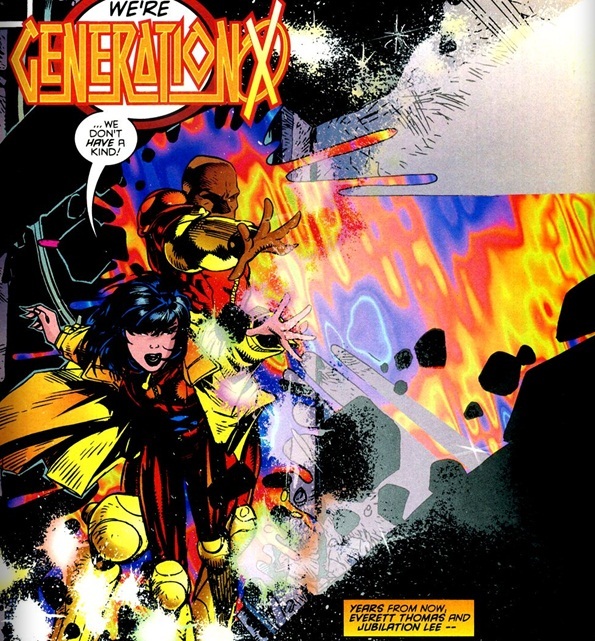 After Synching with the M-twins and being crushed under a wall the two separate into Nicole and Claudette thus revealing that the twins had been posing as Monet since the Phalanx battle [Generation X #31]. He later bonded with Jubilee as they traded guilt stories [Generation X #32]. The twins are then merged with Emplate to become the villain M-Plate [Generation X #34]. He is captured by this new entity which had plans for him. Taken to the edge of time Synch frees the prisoner Gaia [Generation X #35, 36, 37 and 38]. Upon escaping the dimension he was badly beaten by Dorian and weasel two mutant hating punks [Generation x #39]. Upon regaining consciousness he heard the origins of the St. Croix family. The M-twins ended up trapped with penance while the real Monet was free and back to normal [Generation X #40]. Synch forgave Dorian and Weasel for beating him by offering to pay for their new van proving he was truly altruistic [Generation X #44]. He shared an emotional moment with Monet who was being ignored after the Psi-War [Generation X #45]. When Maggott briefly joined the team he aided his fellow mutant against a mutant hunter [Generation X #48-49]. At the behest of Emma Frost’s sister Adrienne the school accepted a majority human student population to make it more viable and profitable. Synch and friends had to reluctantly watch as their school was taken over. On a trip to Boston Everett was caught between Jubilee and Monet. He was pulled away by Monet for some one on one time. Monet took him to a tattoo parlour where she tried to kiss him. They were interrupted by Gene-nation who captured them and took them to Dark Beast [Generation X #50]. Rescued by Gaia, Emma and Nate Grey they defeated the Gene-Nationals and returned to the school [X-man #50]. Upon returning to the school they are given new x-men like costumes by Adrienne and they rescue human student Tristan from his grandfather’s superhuman base [Generation X #51]. The team is next sent to Madripoor by Adrienne to recover the sword used to kill her late husband. They battle the Rising Sons [Generation X #53-54]. Next they are pulled into the final days of the Hellions and are almost killed in the illusion cast by Adrienne in cruel revenge over the vendetta she and her sister Emma had since they were teens [Generation X #55-56]. During the ordeal he showed a glimpse of just how much he cared for Monet and Jubilee grew jealous [Generation X #56]. During the school dance he brought Jubilee as his date and they fought off Emplate and his new Hellions [Generation X #57]. The villain was defeated and the M-Twins were freed from Penance and shared an emotional reunion with big sister Monet. Synch and Jubilee continued to grow closer though he was oblivious to her wanting more than friendship from him [Generation x #57]. He later assisted in retrieving Penance when she escaped from the infirmary [Generation X #58]. On a trip to Manhattan Synch finally saw his idol the Black Panther in the flesh, and was kissed by She Hulk [Generation X #59]. Monet briefly left the school because of her father, Cartier. When she returned the school was full of anti-mutant hysteria and he found himself drawn to Jubilee and Monet. Jubilee realized his feelings for Monet and grew distant. Monet meanwhile opened up to Synch and the two finally started a romance [Generation X #67]. Tensions continued to rise at the school as the human students started become violent [Generation X #68-69]. Adrienne Frost is revealed as the culprit behind everything and bombs had been planted throughout the school. Trying to save those who feared and hated him Synch threw himself on a bomb while telepathically connected to Monet but too far away to truly mimic her invulnerability [Generation X #70]. His death left both Jubilee and Monet deeply traumatized. They grew closer after his passing after bonding over their shared grief. Synch was brought back to life years later by Eli Bard who was working for Selene the Black Queen of the Hellfire Club. In a bid to make Selene a goddess the techo-organic transmode virus of the Phalanx was used to resurrect him and countless others. He was sent to battle the mutants of Utopia alongside Skin his former teammate [X-force v3. #22]. It is assumed he was killed when Selene absorbed the souls of the resurrected mutants as she ascended to godhood. He is presumed dead once more. In the dystopic future known as ‘Days of future past’ Everett along with jubilee and leech are the only surviving members of generation x. Synch and lee are lovers in this world and allied with the mutant resistance which includes magnet [Wolverine days of future past #1]. He reluctantly allows lee to jon magneto on a mission despite his reservations. At the rendevoux point they meet with Charlotte Jones who fills them in on what’s happening with the x-men.Here they are attacked by Baron Zemo and his thunderbolts [Wolverine days of future past #2 ]. Captured by them he is freed by Wolverine and joins the battle against Psylocke, Shinobi Shaw and Zemo who are using the Scarlet Witch. He takes out Zemo wih his powers and they later f;lee the base as it is destroyed. Alongside Magneto, Emma Frost, Leech, Jubilee and Amiko they rebuild the X-men [Wolverine days of future past#3]. Another Black character who dies a pointless, outrage inducing death. Is anyone not seeing a comicbook media pattern yet when it comes to Black characters? WOW! not that he could of took M’s powers and survived the bomb! But hey i guess Marvel didn’t want that, since he had the power to be the most powerfull mutant other than Darwin!